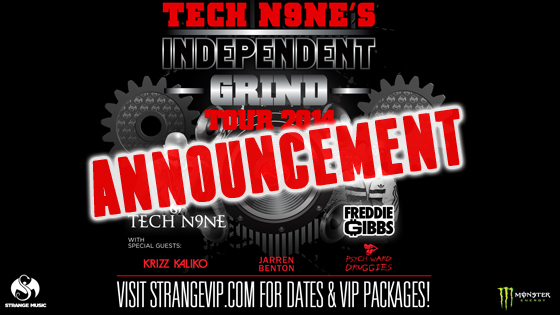 ANNOUNCEMENT: Independent Grind Tour – Tulsa, OK Rescheduled To 7/12! We regret to inform you that we have to postpone the Tuesday, 6/24, Independent Grind Tour stop at Cain’s in Tulsa, Oklahoma. However, this postponement is due to some really exciting news that will be coming your way shortly (stay tuned for that!). We are rescheduling this show for Saturday, 7/12. All tickets and VIP Meet & Greet packages from the original 6/24 show will be honored at the rescheduled show. Please note, there will be new support acts for the rescheduled show on 7/12 – Freddie Gibbs, Jarren Benton AND Psych Ward Druggies will, unfortunately, not be performing at that show. The lineup for that show will be Tech N9ne featuring Krizz Kaliko with support acts Stevie Stone and Kutt Calhoun. Click here for tickets and VIP packages. We appreciate your understanding and apologize for any inconvenience this causes anyone. Thanks for your support and we’ll see you at the show! TECH N9NE’S INDEPENDENT GRIND TOUR!